Dr. Tweedle is a Stefanie Spielman Professor of Radiology at The Ohio State University, Columbus, OH; Dr. Kanal is Professor of Radiology and Neuroradiology at the University of Pittsburgh Medical Center, Pittsburgh, PA; and Dr. Muller is in the Department of General, Organic & Biochemical Chemistry, University of Mons, Mons, Belgium. The use of gadolinium-based contrast agents (GBCAs) to enhance the sensitivity and specificity of magnetic resonance imaging (MRI) has been part of standard clinical practice for over 2 decades. Currently, there are 9 GBCAs approved by the U.S. Food and Drug Administration (FDA) that vary in a number of properties, some of which may significantly impact their clinical utility, particularly for specific applications. So what criteria should radiologists use to select a GBCA? Of the various physicochemical properties, the criteria most important to radiologists for optimization of diagnostic efficacy and patient safety are relaxivity and stability. A GBCA with a higher relaxivity provides increased signal intensity, greater contrast enhancement, and improved diagnostic efficacy.1-3 In addition, the higher signal seen with higher-relaxivity agents affords the potential to use lower doses in patients at risk of developing nephrogenic systemic fibrosis (NSF).4-9 Stability is an important consideration because free gadolinium (Gd3+) is toxic and, therefore, the ability of the ligand to bind tightly to the Gd ion is an important safety consideration.10 Moreover, since 2006, when an association was made between the development of NSF and the administration of Gd,11 stability has become an even greater concern in the selection of a GBCA. 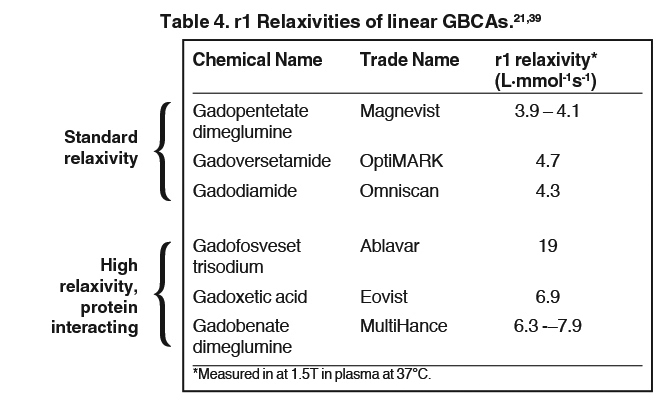 The 9 available GBCAs can be classified on the basis of relaxivity into 3 groups: macrocyclic standard relaxivity agents (including gadoterate meglumine [Dotarem],12 gadobutrol [Gadavist],13 and gadoteridol [ProHance]),14 linear standard relaxivity agents (gadopentetate dimeglumine [Magnevist]),15 gadodiamide [Omniscan],16 and gadoversetamide [OptiMARK]),17 and high-relaxivity agents, which interact with or overtly bind to proteins (the blood pool agent gadofosveset trisodium (Ablavar),18 the liver imaging agent gadoxetic acid (Eovist),19 and the multipurpose agent gadobenate dimeglumine (MultiHance)20 (Table 1). While all 3 of these high-relaxivity agents are linear in structure, there are some interesting observations regarding unconfounded NSF association – or lack thereof – with these agents that will be covered below. Here we describe the differences among these 3 groups of GBCAs, including the advantages and disadvantages of their physicochemical profiles as they pertain to the selection of a GBCA. In addition, we summarize the published evidence surrounding the efficacy and safety of these 3 groups of agents. Finally, we discuss considerations when adopting a new GBCA for a radiology practice in order to maximize diagnostic yield while minimizing patient risk. Three macrocyclic agents are currently approved by the FDA: gadoterate meglumine (Dotarem), gadobutrol (Gadavist), and gadoteridol (ProHance). In terms of relaxivity, all are nonprotein binding and therefore standard relaxivity, with r1 relaxivities in the range of 4 to 5 L·mmol-1s-1.21 In terms of stability, macrocyclic agents utilize a closed, cage-like ligand that surrounds and binds tightly to the Gd ion, resulting in highly stable complexes (Table 2).10 Many published studies exist to support the high stability of these macrocyclic agents relative to the linear agents and, in terms of clinical value, these data can be considered to exist within a hierarchy, from in vitro, test-tube data at the bottom all the way up to human in vivo data at the top (Figure 1). 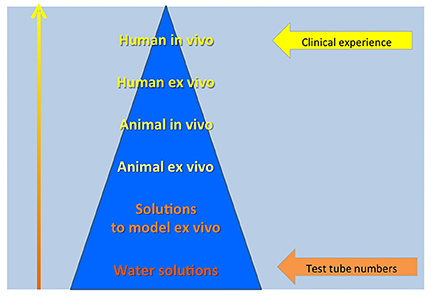 When assessing the various data, it is important to recognize that higher-level data (eg, clinical experience) always trump data lower on the hierarchy (eg, test tube numbers). 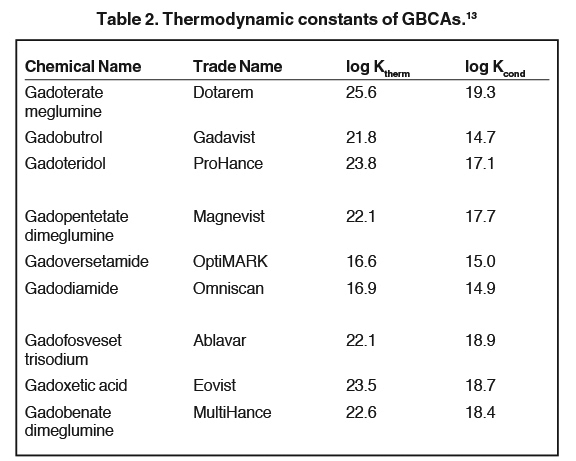 Test-tube data derived from GBCAs in solution demonstrate that as a class, the macrocyclic agents have high thermodynamic binding constants (log Ktherm and log Kcond [essentially log Ktherm measured at physiologic pH]) (Table 2).10 In vivo, the dissociation of GBCAs into gadolinium ion and ligand can be facilitated by a number of competing endogenous metals, such as zinc, copper, calcium, and iron, all of which may work simultaneously to destabilize the complex and lead to its dissociation. This displacement of the gadolinium ion from its ligand by other metals through competitive ionic binding is termed transmetallation (or dissociation or dechelation), and transmetallation has been studied both in vivo and in vitro. 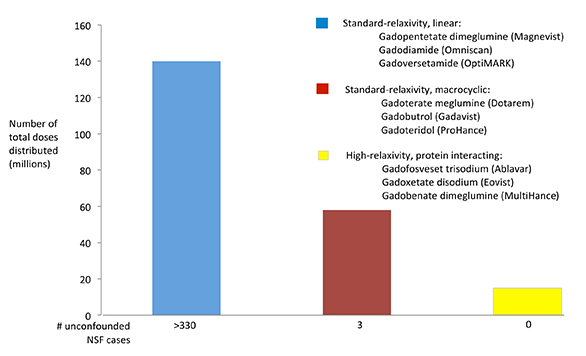 In vitro, copper and zinc ion stress test data demonstrate that in the presence of these competitors, the macrocyclic agents gadoterate meglumine (Dotarem) and gadoteridol (ProHance) remain essentially intact (<1% reaction), while the less stable linear agents gadodiamide (Omniscan) and gadopentetate dimeglumine (Magnevist) are more highly reactive.22 In vivo data from mice and rats also demonstrate that up to 14 days after injection of radiolabeled GBCAs, the lowest levels of residual Gd are observed with the macrocyclic agents23 (Figure 2). Taken together, all of these data suggest that transmetallation occurs both ex vivo and in vivo, and that with low stability linear GBCAs, there is more marked displacement of the gadolinium ion from its ligand by other metals. It is notable that the only GBCA with a triple dose indication is one of the macrocyclic agents, gadoteridol (ProHance)14 (the approval for triple dose indication for the linear agent gadodiamide [Omniscan] was withdrawn by the FDA in December, 2010). 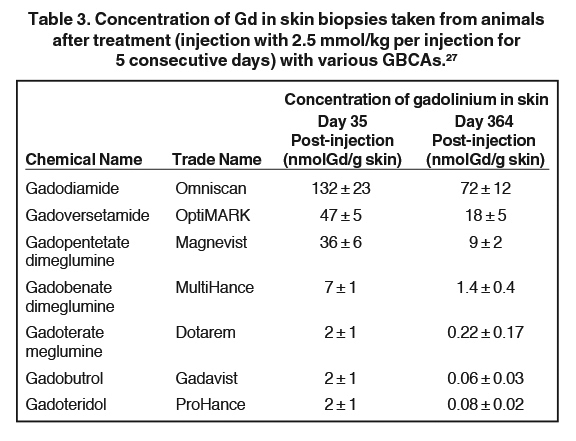 It should also be noted that Pietsch and colleagues recently used a sensitive in vivo animal model to derive elimination time-courses for Gd in the skin of rats and found significantly higher nmolGd/g of skin at both Day 35 and Day 364 for the less stable agents compared with the macrocyclic agents (Table 3).27 However, a very small amount of Gd was still present in the skin of rats administered a macrocyclic agent on day 364, indicating that although the risk of dissociation with macrocyclic GBCAs is very low, this “low risk” is not equivalent to “no risk” and therefore, in patients at highest risk of NSF, it is still best to carefully assess the risk vs the benefit of injecting any GBCA. Returning now to our 3 groups of agents, macrocyclic agents with standard relaxivity, linear agents with standard relaxivity, and linear agents with higher relaxivity, how does one select a GBCA for routine use applications? It has been well established that greater relaxivity leads to higher signal intensity enhancement. Of the multipurpose linear agents, gadobenate dimeglumine (MultiHance) has the highest r1 relaxivity at 1.5T, and this high relaxivity persists at 3T.39 Tables 5 and 6 summarize results from the most recent, robust intraindividual crossover studies comparing the efficacy of gadobenate dimeglumine (MultiHance) with standard relaxivity agents for MR imaging of the CNS (Table 5) and vasculature (Table 6). Examples of image pairs from published comparative studies are shown in Figure 6. 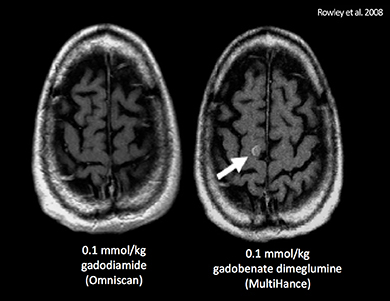 From this body of evidence, one can conclude that at typical so-called T1-weighted imaging approaches, a single dose of gadobenate dimeglumine (MultiHance) is very roughly diagnostically equivalent to a double dose of a standard relaxivity agent, and that it provides better qualitative and quantitative diagnostic MR images when compared to an equivalent dose of a standard-relaxivity agent, for a variety of applications. Upon adoption of a new drug, reported AE rates may go up initially but over time, tend to return to baseline. This was first observed by Weber in 1984 and has thus been termed the Weber effect.42 Davenport and colleagues observed the Weber effect at their institution when switching from gadopentetate dimeglumine (Magnevist) to gadobenate dimeglumine (MultiHance).43 Specifically, they noted that the reaction rates for gadobenate dimeglumine (MultiHance) peaked in the second year after it replaced gadopentetate dimeglumine (Magnevist), and then declined in the third year, ultimately returning to a baseline rate that did not differ significantly from the original baseline rate of gadopentetate dimeglumine (Magnevist) (Figure 7). 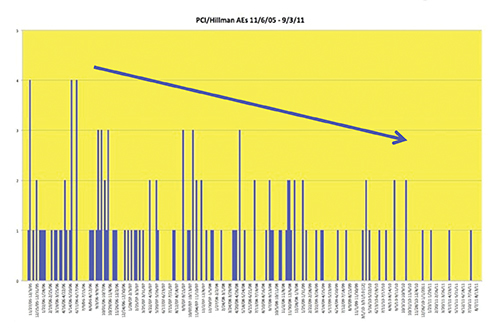 The reasons for the Weber effect are complex and not completely understood, but it is generally believed to be related to unfamiliarity with a new drug, or new contrast agent in this case, and/or concern from staff regarding the change. The most significant potential nonacute event associated with Gd exposure remains NSF. The factors most closely associated with the development of NSF include severe renal failure in the patient, exposure to multiple/high doses of a GBCA, and administration of a less stable GBCA.41,46 However, the majority of patients with severe renal failure administered multiple and/or high doses of a relatively unstable GBCA do not develop NSF, so it is likely that there remain unidentified factors that contribute to the development of NSF. Per the American College of Radiology, GBCAs can be grouped into 3 groups according to their NSF risk (Figure 9).41 These groupings are based on the numbers of unconfounded, single-agent cases of NSF recorded for each agent. However, it is also interesting to examine the number of unconfounded NSF cases and the number of doses distributed, but to do so using the grouping system introduced in the introduction (Figure 10). When one does so, there are 2 apparent observations: first, and not surprisingly, the incidence of NSF with the macrocyclic agents is extremely low considering the number of administered doses and, second, that the number of NSF cases is surprisingly low in the group of intermediate-stability, protein interacting GBCAs, including gadofosveset trisodium (Ablavar), gadoxetate meglumine (Eovist), and gadobenate dimeglumine (MultiHance), considering their number of administered doses, suggesting perhaps that there is something protective about protein binding that mitigates or prevents the development of NSF. Any evidence for such protection, or any possible mechanism, remains to be established. Chemical stability and in vivo relaxivity are the GBCA properties most relevant for selection of a contrast agent for MRI. Agents with a macrocyclic structure are the most highly stable and, as they do not bind to serum proteins, they all possess similar, relatively low relaxivity. Relatively lower stability linear agents may be of standard or high relaxivity. 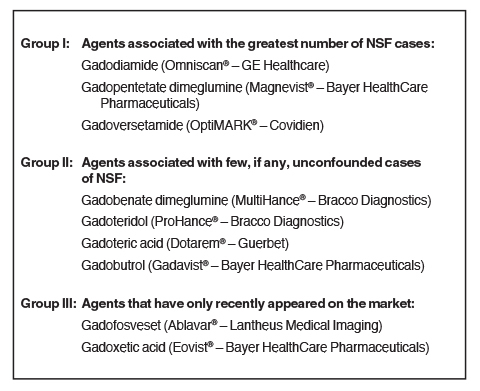 No cases of NSF have been reported after the prior unconfounded administration of any of the high-relaxivity protein interacting agents, the vascular imaging agent gadofosveset trisodium (Ablavar), the hepatic imaging agent gadoxetate meglumine (Eovist), or the CNS/multipurpose agent gadobenate dimeglumine (MultiHance). In terms of NSF, “low risk” does not appear to be equivalent to “no risk”; some level of caution is still warranted for all agents in the highest-risk patients. Maravilla KR, Maldjian JA, Schmalfuss IM, et al. Contrast enhancement of central nervous system lesions: multicenter intraindividual crossover comparative study of two MR contrast agents. Radiology. 2006;240:389-400. Rowley HA, Scialfa G, Gao PY, et al. 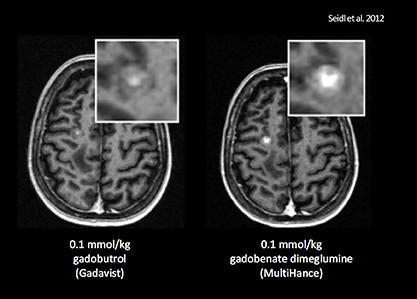 Contrast-enhanced MR imaging of brain lesions: a large scale intraindividual crossover comparison of gadobenate dimeglumine versus gadodiamide. AJNR Am J Neuroradiol. 2008;29:1684-1691. Seidl Z, Vymazal J, Mechl M, et al. Does higher gadolinium concentration play a role in the morphologic assessment of brain tumors? Results of a multicenter intraindividual crossover comparison of gadobutrol versus gadobenate dimeglumine (the MERIT Study). AJNR Am J Neuroradiol. 2012;33:1050-1058. Pediconi F, Fraioli F, Catalano C, et al. Gadobenate dimeglumine (Gd-DTPA) vs gadopentetate dimeglumine (Gd-BOPTA) for contrast-enhanced magnetic resonance angiography (MRA): Improvement in intravascular signal intensity and contrast to noise ratio. Radiol Med (Torino). 2003;106:87-93. Prokop M, Schneider G, Vanzulli A, et al. Contrast-enhanced MR angiography of the renal arteries: blinded multicenter crossover comparison of gadobenate dimeglumine and gadopentetate dimeglumine. Radiology. 2005;234:399-408. Achenbach M, Figiel JH, Burbelko M, Heverhagen JT. Prospective comparison of image quality and diagnostic accuracy of 0.5 molar gadobenate dimeglumine and 1.0 molar gadobutrol in contrast-enhanced run-off magnetic resonance angiography of the lower extremities. J Magn Reson Imaging. 2010;32:1166-1171. Woodard PK, Chenevert TL, Sostman HD, et al. Signal quality of single dose gadobenate dimeglumine pulmonary MRA examinations exceeds quality of MRA performed with double dose gadopentetate dimeglumine. Int J Cardiovasc Imaging. 2012;28:295-301. Li Y, Li X, Li D, et al. Multicenter, intraindividual comparison of single-dose gadobenate dimeglumine and double-dose gadopentetate dimeglumine for MR angiography of the supra-aortic arteries (the Supra-Aortic VALUE study). AJNR Am J Neuroradiol. 2013;34:847-854. Wang J, Yan F, Liu J, et al. Multicenter, intra-individual comparison of single dose gadobenate dimeglumine and double dose gadopentetate dimeglumine for MR angiography of the peripheral arteries (the Peripheral VALUE Study). J Magn Reson Imaging. 2013;38:926-937. Tweedle MF. 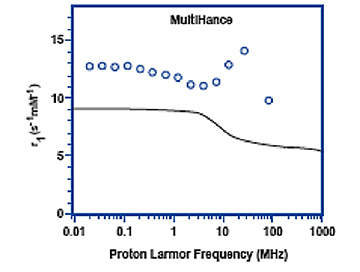 The ProHance story: the making of a novel MRI contrast agent. Eur Radiol. 1997;7 Suppl 5:225-30. Grobner T. Gadolinium--a specific trigger for the development of nephrogenic fibrosing dermopathy and nephrogenic systemic fibrosis? Nephrol Dial Transplant. 2006;21:1104-1108. Dotarem® (gadoteric acid) [product information]. Wayne, NJ: Guerbet; March 2013. 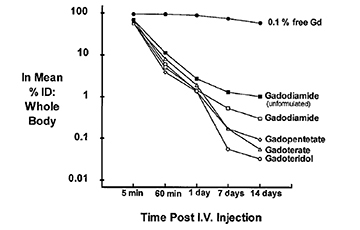 Gadavist™ (gadobutrol) injection [prescribing information]. Wayne, NJ; Bayer HealthCare Pharmaceuticals; March 2011. ProHance® (gadoteridol) injection, 279.3 mg/mL [prescribing information]. Princeton, NJ: Bracco Diagnostics Inc.; revised September 2011. Magnevist® (brand of gadopentetate dimeglumine) injection [prescribing information].Wayne, NJ: Bayer HealthCare Pharmaceuticals; March 2012. Omniscan™ (gadodiamide) injection [prescribing information]. Princeton, NJ: Amersham Health Inc.; December 2010. OptiMARK® 0.5 mmol/mL (gadoversetamide injection) [prescribing information]. St. Louis, MO: Mallinckrodt Inc.; November 2010. Ablavar® (gadofosveset trisodium) [prescribing information]. North Billerica, MA: Lantheus Medical Imaging, Inc.; February 2011. Eovist® (gadoxetate disodium) [prescribing information]. Wayne, NJ: Bayer HealthCare Pharmaceuticals; November 2011. MultiHance® (gadobenate dimeglumine) injection, 529 mg/mL [prescribing information]. Princeton, NJ; Bracco Diagnostics Inc.; July 2012. Rohrer M, et al. 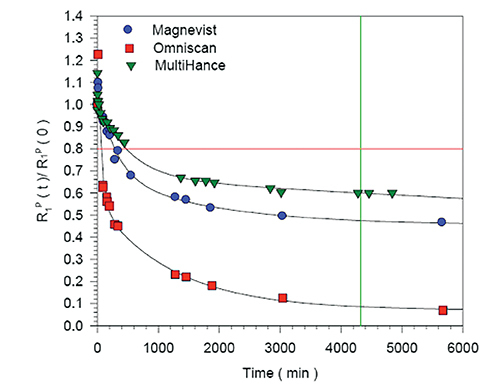 Comparison of magnetic properties of MRI contrast media solutions at different magnetic field strengths. Invest Radiol. 2005;40:715-724. 5. Tweedle MF, Hagan JJ, Kumar K, Mantha S, Chang CA. Reaction of gadolinium chelates with endogenously available ions. Magn Reson Imaging. 1991;9(3):409-15. Tweedle MF, Wedeking P, Kumar K. Biodistribution of radiolabeled, formulated gadopentetate, gadoteridol, gadoterate, and gadodiamide in mice and rats. Invest Radiol. 1995 Jun;30(6):372-80. Prince MR, Erel HE, Lent RW, Blumenfeld J, Kent KC, Bush HL, Wang Y. Gadodiamide administration causes spurious hypocalcemia. Radiology. 2003 Jun;227(3):639-46. Frenzel T, Lengsfeld P, Schirmer H, Hütter J, Weinmann HJ. 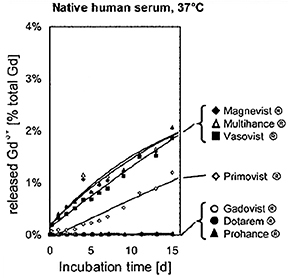 Stability of gadolinium-based magnetic resonance imaging contrast agents in human serum at 37 degrees C. Invest Radiol. 2008;43:817-828. White GW, Gibby WA, Tweedle MF. Comparison of Gd(DTPA-BMA) (Omniscan) versus Gd(HP-DO3A) (ProHance) relative to gadolinium retention in human bone tissue by inductively coupled plasma mass spectroscopy. Invest Radiol. 2006 Mar;41(3):272-8. Pietsch H, Pering C, Lengsfeld P, Walter J, Steger-Hartmann T, Golfier S, Frenzel T, Hütter J, Weinmann HJ, Sieber MA. Evaluating the role of zinc in the occurrence of fibrosis of the skin: a preclinical study. J Magn Reson Imaging. 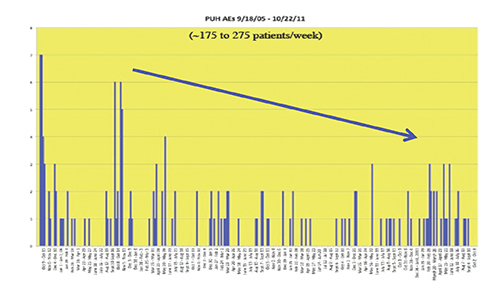 2009 Aug;30(2):374-83. doi: 10.1002/jmri.21845. Ersoy H1, Rybicki FJ. Biochemical safety profiles of gadolinium-based extracellular contrast agents and nephrogenic systemic fibrosis. J Magn Reson Imaging. 2007;26:1190-1197. Idée JM, Port M, Robic C, Medina C, Sabatou M, Corot C. Role of thermodynamic and kinetic parameters in gadolinium chelate stability. J Magn Reson Imaging. 2009;30:1249-1258. Laurent S, Elst LV, Muller RN. 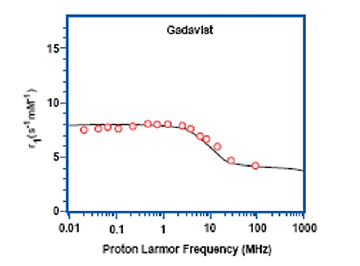 Comparative study of the physicochemical properties of six clinical low molecular weight gadolinium contrast agents. Contrast Med Mol Imaging. 2006;1:128-137. Giesel FL, von Tengg-Kobligk H, Wilkinson ID, et al. Influence of human serum albumin on longitudinal and transverse relaxation rates (r1 and r2) of magnetic resonance contrast agents. Invest Radiol. 2006;41:222-228. Martincich L, Faivre-Pierret M, Zechmann CM, et al. Multicenter, double-blind, randomized, intraindividual crossover comparison of gadobenate dimeglumine and gadopentetate dimeglumine for breast MR imaging (DETECT Trial). Radiology. 2011;258:396-408. Schneider G, Maas R, Schultze Kool L, et al. Low-dose gadobenate dimeglumine versus standard dose gadopentetate dimeglumine for contrast-enhanced magnetic resonance imaging of the liver: an intra-individual crossover comparison. Invest Radiol. 2003;38:85-94. Knopp MV, Schoenberg SO, Rehm C, et al. 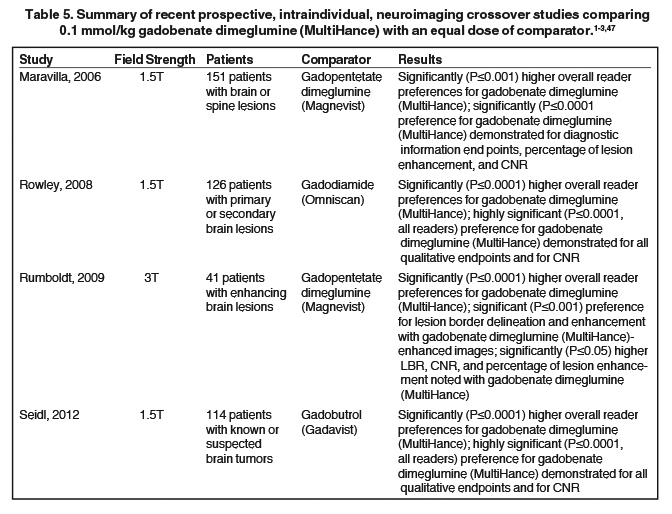 Assessment of gadobenate dimeglumine for magnetic resonance angiography: phase I studies. Invest Radiol. 2002;37:706-715. Knopp MV, Giesel FL, von Tengg-Kobligk H, et al. Contrast-enhanced MR angiography of the run-off vasculature: intraindividual comparison of gadobenate dimeglumine with gadopentetate dimeglumine. J Magn Reson Imaging. 2003;17:694-702. Bueltmann E, Erb G, Kirchin MA, Klose U, Naegele T. Intra-individual crossover comparison of gadobenate dimeglumine and gadopentetate dimeglumine for contrast-enhanced magnetic resonance angiography of the supraaortic vessels at 3 Tesla. Invest Radiol. 2008;43:695-702. Gerretsen SC, le Maire TF, Miller S, et al. Multicenter, double-blind, randomized, intraindividual crossover comparison of gadobenate dimeglumine and gadopentetate dimeglumine for MR angiography of peripheral arteries. Radiology. 2010;255:988-1000. Pintaske J, Martirosian P, Graf H, et al. 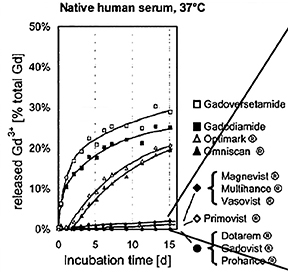 Relaxivity of gadopentetate dimeglumine (Magnevist), gadobutrol (Gadovist), and gadobenate dimeglumine (MultiHance) in human blood plasma at 0.2, 1.5, and 3 Tesla [erratum in Invest Radiol. 2006;41:859]. Invest Radiol. 2006;41:213-221. Shellock FG, Parker JR, Venetianer C, et al. Safety of gadobenate dimeglumine (MultiHance): summary of findings from clinical studies and postmarketing surveillance. Invest Radiol. 2006;41:500-509. American College of Radiology (ACR). ACR Manual on Contrast Media. 2013; version 9:81-98. Available at: http://www.acr.org/~/media/ACR/Documents/PDF/QualitySafety/Resources/Contrast%20Manual/2013_Contrast_Media.pdf. Weber JCP. Epidemiology of Adverse Reactions to Nonsteroidal Antiinflammatory Drugs. New York, NY: Raven Press; 1984:1–7. Rainsford KD, Velo GP, eds. Advances in Inflammation Research; vol 6. Davenport MS, Dillman JR, Cohan RH, et al. Effect of abrupt substitution of gadobenate dimeglumine for gadopentetate dimeglumine on rate of allergic-like reactions. Radiology. 2013;266:773-782. 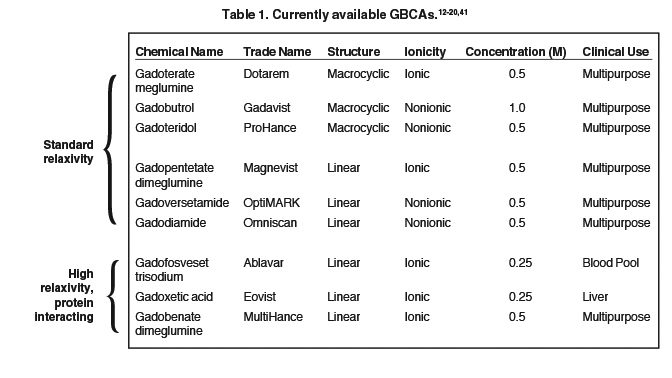 Bleicher AG, Kanal E. Assessment of adverse reaction rates to a newly approved MRI contrast agent: review of 23,553 administrations of gadobenate dimeglumine. AJR Am J Roentgenol. 2008 Dec;191(6):W307-11. Thomsen HS. Nephrogenic systemic fibrosis: a serious late adverse reaction to gadodiamide. Eur Radiol. 2006;16:2619-2621. Rumboldt Z, et al. 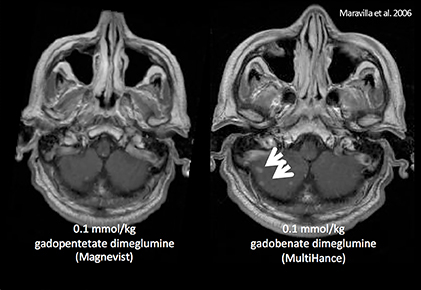 Multicenter, double-blind, randomized, intra-individual crossover comparison of gadobenate dimeglumine and gadopentetate dimeglumine in MRI of brain tumors at 3 Tesla. JMRI. 2009;29:760-767. Attenberger UI, Michaely HJ, Wintersperger BJ, et al. 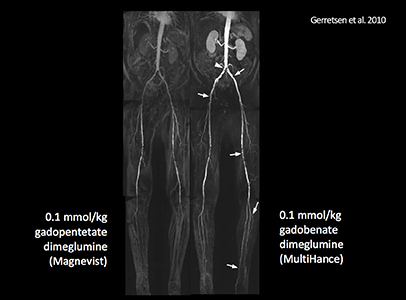 Three-dimensional contrast-enhanced magnetic-resonance angiography of the renal arteries: interindividual comparison of 0.2 mmol/kg gadobutrol at 1.5 T and 0.1 mmol/kg gadobenate dimeglumine at 3.0 T. Euro Radiol. 2008;18(6):1260-8. Spampinato MV, Nguyen SA, Rumboldt Z. 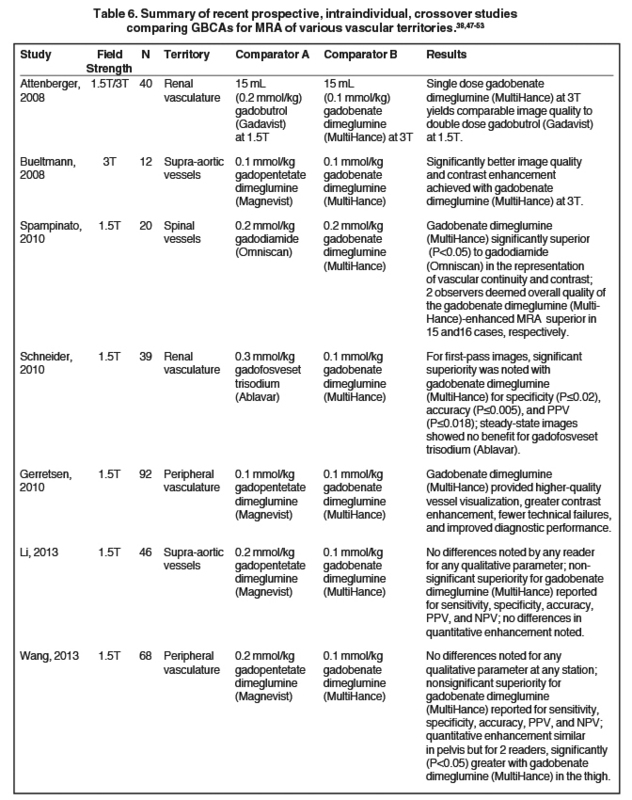 Comparison of gadobenate dimeglumine and gadodiamide in the evaluation of spinal vascular anatomy with MR angiography. AJR Am J Neuroradiol. 2010;31:1151-1156. This article was published in a supplement to the May 2014 issue of Applied Radiology and was sponsored by an educational grant from Bracco. Considerations in the Selection of a New Gadolinium-Based Contrast Agent. Appl Radiol.